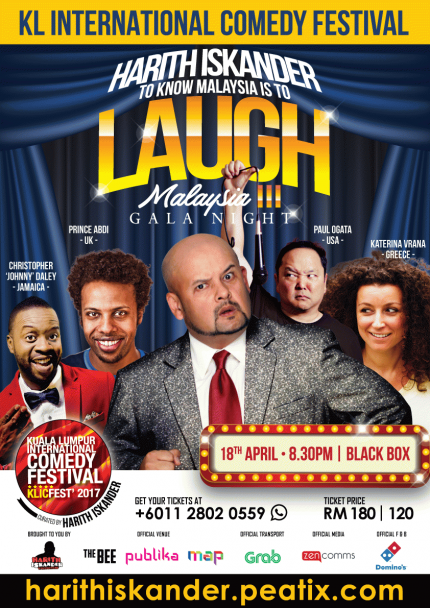 Malaysian God of Comedy Harith Iskander is ready to deliver another dose of non-stop laughter at Black Box and The Bee in Publika for the 2017 KL International Comedy Festival which is set to take place from 21 to 23 April 2017, featuring some of Harith’s greatest comedian friends from the industry! The festival will feature several comedy shows like Making S#it Up, Stendap Komedi 1, Standing Up Singing Vol 3, Fakkah Fuzz's "Get the Fuzz Out", The Angry Indians, and Nabil Ahmad's MeleSTOP! However, before KLICFest kick off, Harith will be roping in some of the biggest international stars, local legends and the hottest emerging talents for a spectacular and hilarious night of comedy, “To Know Malaysia is to Laugh Malaysia III” on 18 April 2017. Some of featured comedians are Paul Ogata (USA), Prince Abdi (Somalia), Katerina Vrana (Greece), Christopher Daley (Jamaica) and many more. The official festival will start with The Angry Indians on 21 April featuring the best of the best Machas in the comedy industry who will tickle you silly with their anger and sarcasm. They are Andrew Netto, Kavin Jay, Prakash Daniel, Keren Bala Devan and Thenesh. 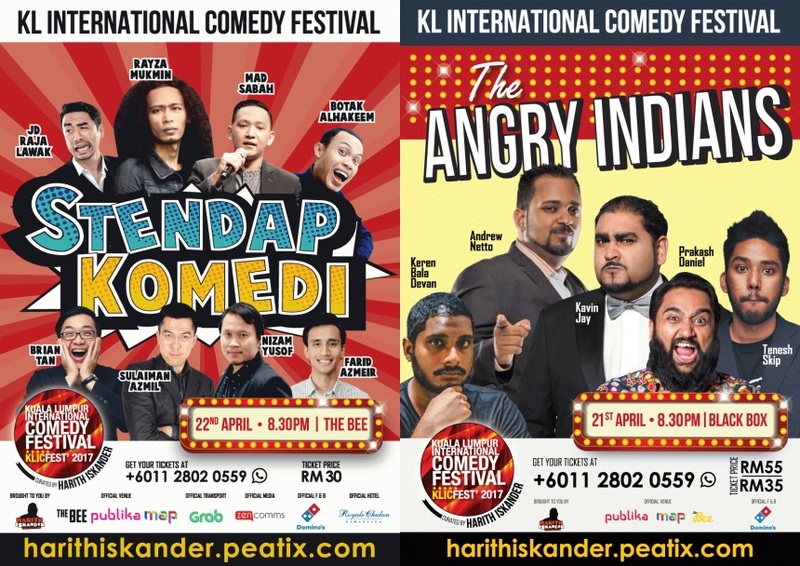 Stendap Komedi 1 will also be on the same day, a stand-up comedy show in full Bahasa Malaysia presenting Nizam Jentik Jentik, JD, Botak Alhakeem, Sulaiman Azmil, Mad Sabah, and Rayza Mukmin. Meanwhile, on 22 April, there will be a one-man show each from Afdlin Shauki, Fakkah Fuzz and Nabil Ahmad for Standing Up Singing Vol. 3, Fakkah Fuzz's "Get the Fuzz Out, and Nabil Ahmad's MeleSTOP, respectively. 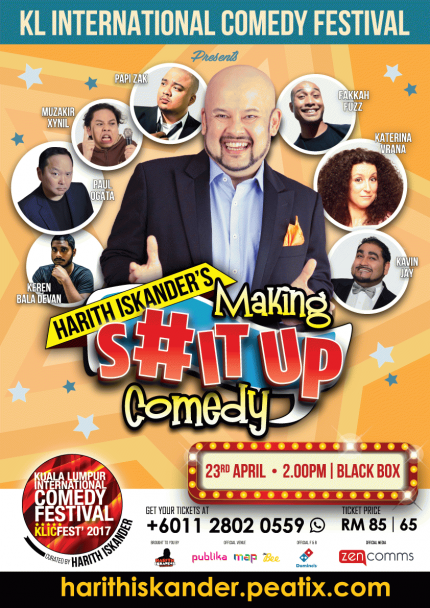 And on the last day of the festival, Harith Iskander and several comedians will be presenting Making S#it Up comedy, where the comedians were thrown out of their comfort zone and into situations that the audience dictate. 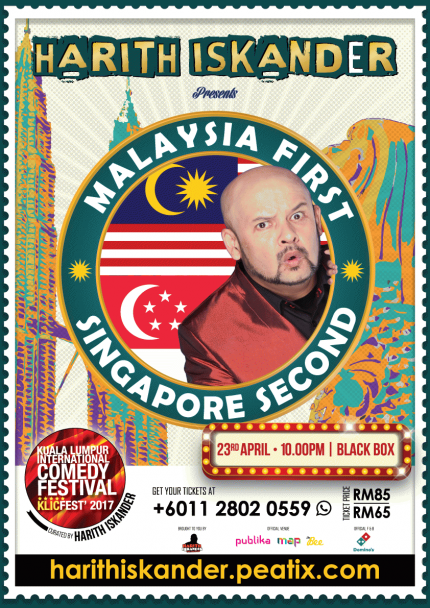 Apart from “Making S#it Up”, Harith will also perform his very own stand-up show on the topic, “Malaysia First, Singapore Second” to wrap up the whole comedy festival. 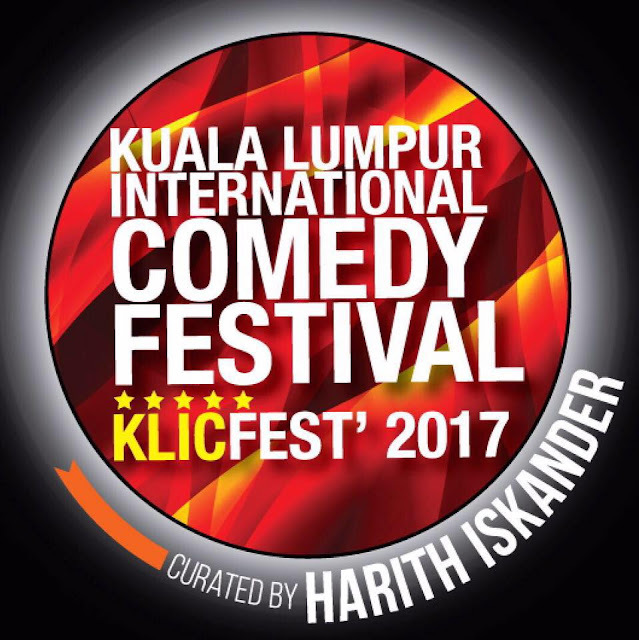 KLICFest debuted in 2015 by Harith Iskander and was considered to be the largest laugh-fest in Asia as it featured 64 comedians from 14 countries. For more information and ticketing details on the festival, visit KLICFest2017 Facebook page or peatix.com.